This document assumes there is already a working SCCM installation in your environment. Hence, SCCM installation, configuration and deployment of the software are not covered in this guide. Customers are advised to contact their IT department for assistance with SCCM-related tasks. This guide also assumes the SCCM client is installed on every workstation on which OpenLM Agent needs to be installed. Download latest OpenLM Agent installer on a network share where it will be accessible by the SCCM server or SCCM server itself. For the purpose of this document we will assume that there is a folder named c:\software on the SCCM server which is shared as \\sccm\software. Replace the above path with your actual OpenLM Agent installer location. On the SCCM server, open the SCCM Configuration Management Console. Go to \Software Library\Overview\Application Management\Applications. Right click in the blank area and select Create Application. The Create Application Wizard dialog will open. 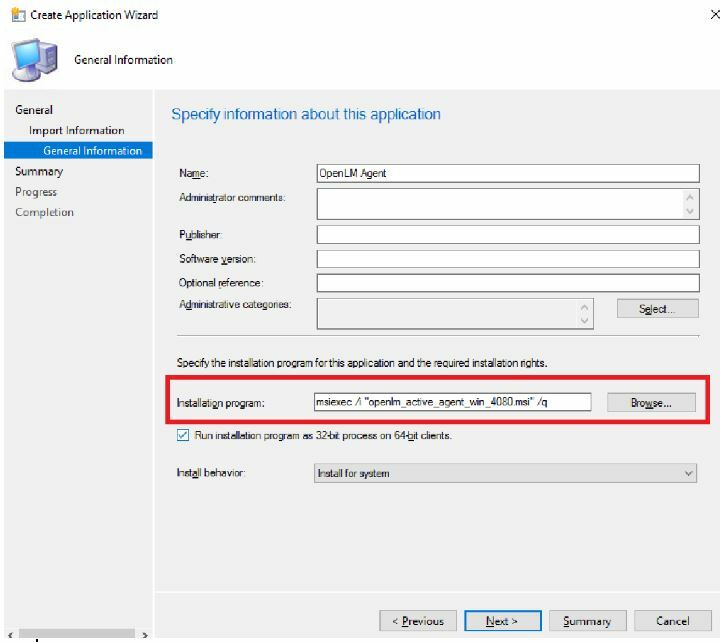 In the Specify settings for this application window, click on the Browse button, navigate to \\sccm\software, select the OpenLM agent version that you wish to install, and then click twice on the Next button. 5. In the Specify information about this application window, complete all relevant details — e.g. Name, Administrative comments, Publisher, etc. — and then make a selection from the Install behavior drop-down menu, in this instance, “Install for system”. 6. To ensure the OpenLM Agent installs correctly, you will need to modify the Installation program field. Replace “openlm_active_agent_win_4080” with the required version, paste it in the Installation program field and click Next. 7. In the Confirm the settings for this application window, review the settings and then click Next. In the next window, click Close. 8. 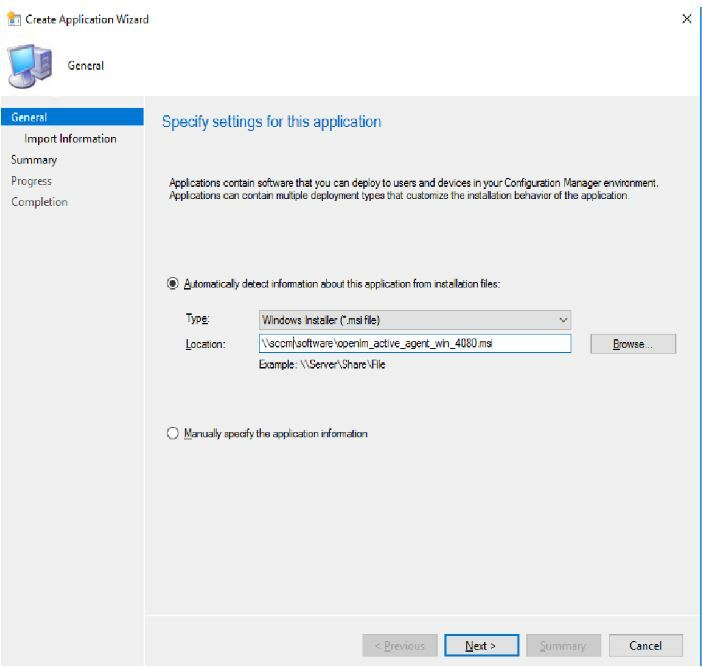 Next you can deploy the application to SCCM-enabled computers. To do this, right-click on the OpenLM Agent application and select Deploy. Now you can specify the desired deployment options — e.g. collection, content destination, how software is deployed, schedule for the deployment, user experience, alert options, etc. 9. Upon successful deployment, the OpenLM Agent should appear in the Software Center on the client and can either be installed automatically or manually.